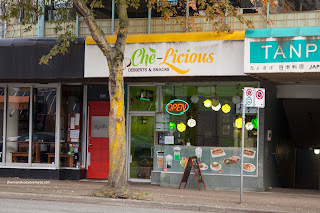 The first time I visited Che-Licious, it was due to an online coupon. I really didn't even know what the place was about and where it was located. 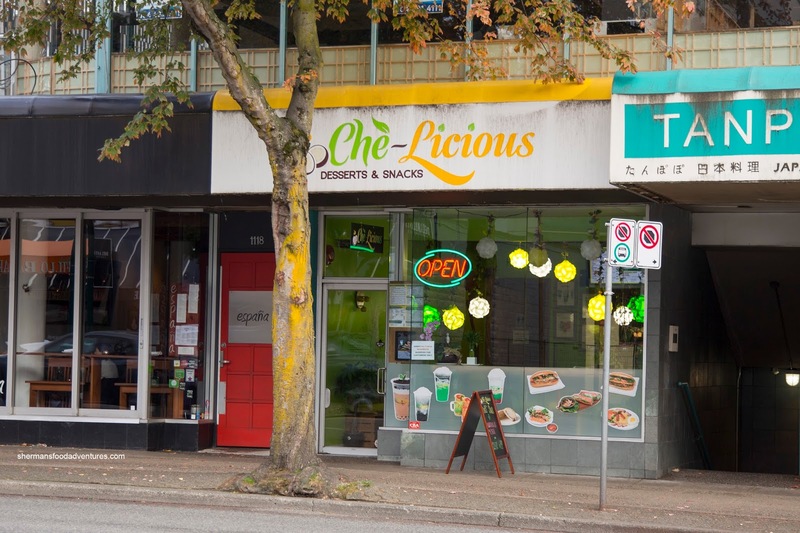 Despite the seemingly endless array of less-than-appealing restaurants offered, there are some places worth trying out from group buy coupon sites. 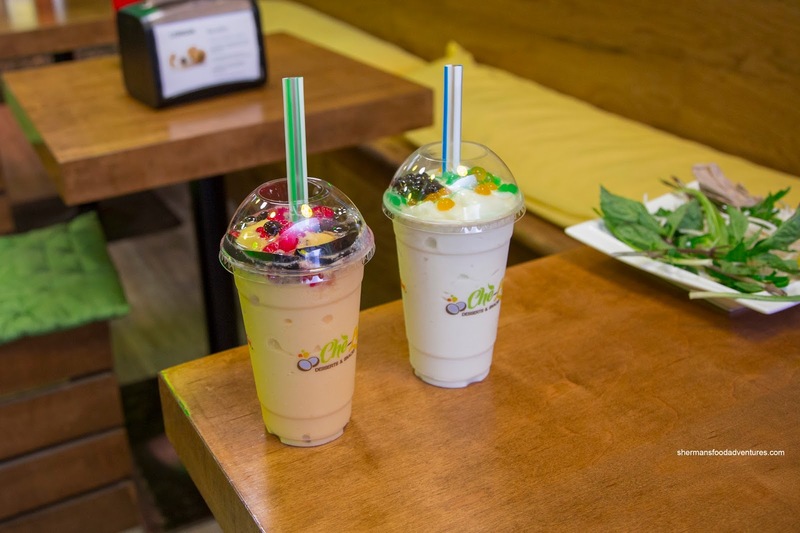 We ended up trying their dessert drinks, appies and banh mi with relatively good results. 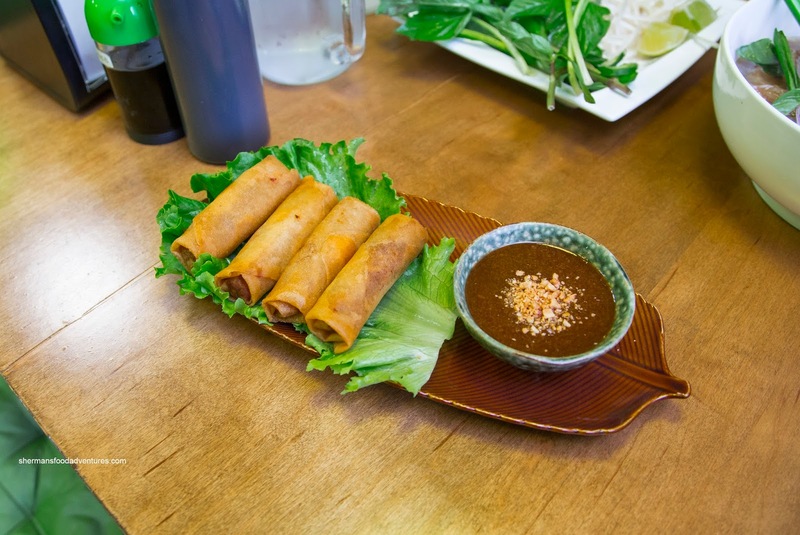 When Sean asked if I could accompany him for a return visit due to the addition of Pho to the menu, it didn't take much to convincing. Before we got to the Pho, we were presented with some drinks including a real Mango Slush with assorted Che ingredients. I really liked the the creamy texture of the slush as the fruit and ice was blended expertly. I asked for it to be easy on the sugar and it was exactly how I liked it while still maintaining a noted mango essence and flavour. For our appy, we shared the Spring Rolls served with an interesting hoisin dip rather than the classic sweetened fish sauce. These were served piping hot and firmly crunchy. The pork and shrimp filling was not too dense while nicely seasoned with a balance of sweet and savoury (wished they used rice wrappers though). 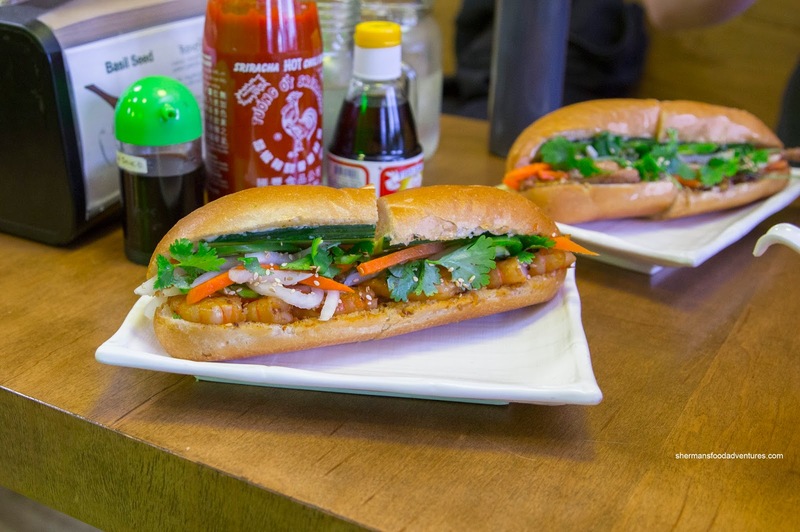 We couldn't forget about their Banh Mi creations, so we went for 2 of them. Stuffed with sauteed shrimp, pickled daikon and carrot, cucumber, cilantro and mayo, the Shine on Shrimp was strangely similar to the one found at Hubbub, but not. First of all, the light and crusty bread ensured that the shrimp wasn't overshadowed. Second of all, the flavours were classic banh mi which made it familiar. Our next one was Get the Chick with the same ingredients except for the protein (being grilled chicken and pate). Well-seasoned and grilled, the chicken retained its moisture while the pate added an aromatic meatiness to the sandwich. Okay, the real reason we were here was for the Pho. It featured a slightly greasy broth that had depth-of-flavour and aroma. It was slightly sweet, but not salty while emitting an noted licorice essence from the star anise. Definitely a bit different than the cookie-cutter broths found in town. As for the noodles, they were toothsome and well-portioned. The meats were plentiful and tender to the chew. 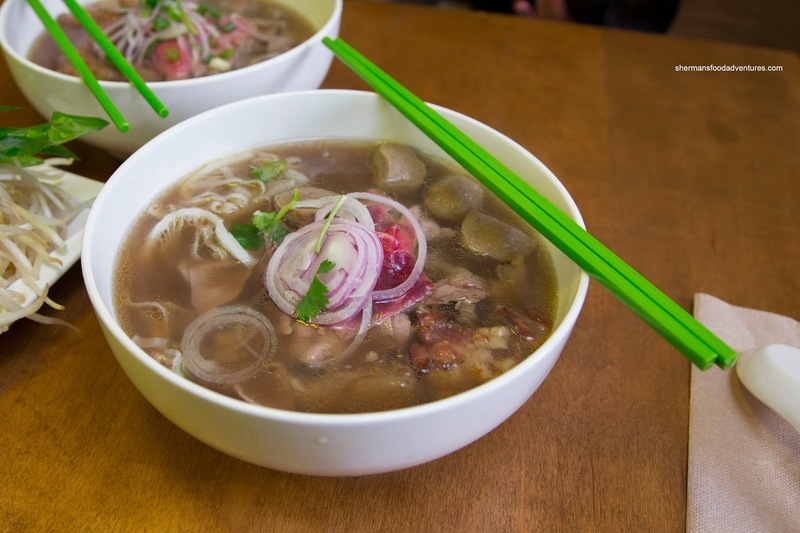 The addition of Pho onto the menu is a good idea in my opinion. 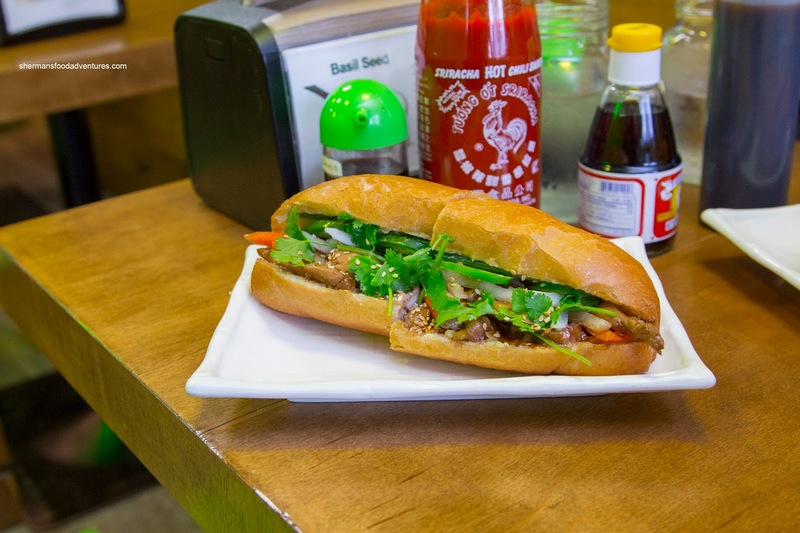 It only adds to the solid array of eats where it provided an option from all the Banh Mi available.